A pharmaceutical company in southwest China's Tibet autonomous region went public Tuesday, the 11th in the underdeveloped plateau region to be listed. Auto giant Volkswagen on Monday sealed a deal to build a new factory in China, as visiting Premier Wen Jiabao and German Chancellor Angela Merkel attended the signing ceremony. The municipal government of Urumqi, Xinjiang Uygur autonomous region is working on the city's greening, city planning, affordable housing, and natural disaster preparedness. The government of Northwest China's Xinjiang Uygur autonomous region has vowed to make more efforts to achieve rapid development and long-term stability during the 12th Five-Year Plan (2011-2015) period. The number of Tibetan farmers and herders living in absolute poverty, with less than 1,700 yuan per capita annual income, was almost halved in the past five years, poverty relief authorities in southwest China's Tibet autonomous region said. The Tibet government will allocate 1 billion yuan ($152 million) in subsidies for children of farmers and herdsmen, in its continued efforts to raise the standard of its "Three Guarantees" policy. During the 12th Five-Year Plan period, the regional Education Department planned to invest up to 1 billion yuan in providing digital facilities for schools at all levels across southwest China's Tibet autonomous region. The Qinghai-Tibet Power Grid Interconnection Project is expected to be completed by the end of 2011, 9 months earlier than planned in September of 2012, source from the construction project headquarters on Feb 15, 2011. Starting on Jan 1, 2011, children of farmers and herdsmen in Tibet began to enjoy the "three guarantees" policy, a preferential policy the central government has granted to Tibet. Approved by the State Council, the Ministry of Finance allocated a special fund for legal aid totaling 700,000 yuan to assist migrant workers, the handicapped, the aged and young people as well as women in legal affairs in southwest China's Tibet autonomous region. 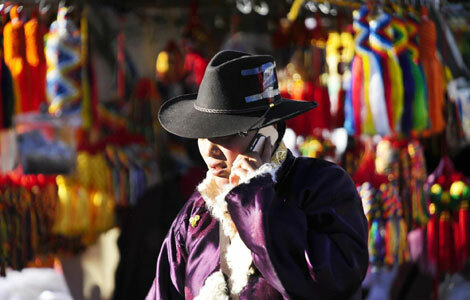 The Tibet autonomous region will build 3,331 more rural village libraries in 2011 with 30,000-yuan fund for each, news from the regional press and publication sector. CAAC (Civil Aviation Administration of China) Xinjiang Regional Administration plans to build a new airport in the Taklimakan Desert during the 12th Five-Year Plan (2011-2015), which will be the first airport built in the desert in China, Beijing Daily reported. China's far western Xinjiang region plans to invest 30 billion yuan ($4.56 billion) in airport construction between 2011 and 2015, local authorities said Jan 30. Cotton pickers carry bags of fresh-cut cotton in Hami prefecture of Xinjiang Uygur autonomous region, Nov 3, 2010. This month is the best cotton picking time in Hami, where field workers are rushing in the harvest. After installing 86 solar insecticidal lights in Nedong County last year, another 85 lamps have recently been put into use in the Yajiang Shelter Forest in Chanang county of Lhoka Prefecture.